At the fifth annual Celebrating Distinction ceremony, Laura P.W. Ranum, PhD, was honored with the appointment of the Kitzman Family Professorship. 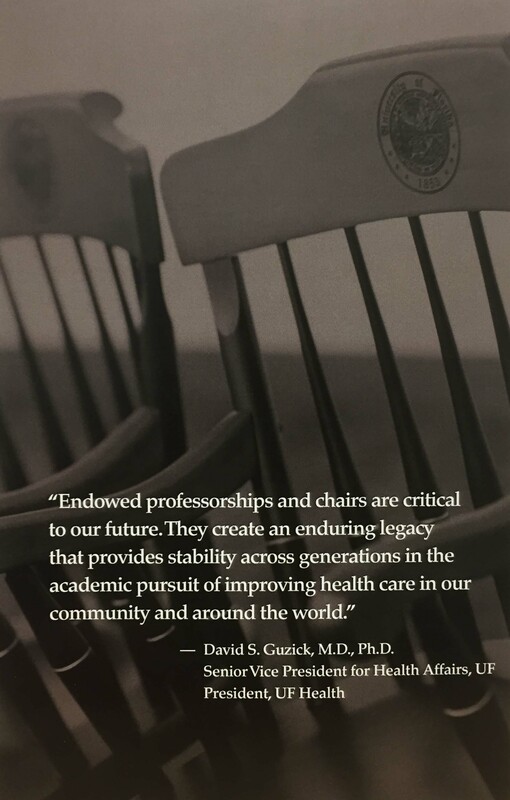 The annual ceremony recognizes many University of Florida Health Science Center faculty members who recently have been named to an endowed professorship or chair. Appointment to a professorship or chair is one of the highest honors a college can bestow on a faculty member and is reserved for scholars of national and international acclaim. Dr. Ranum serves as founding director of the UF College of Medicine Center for NeuroGenetics and is a professor in the department of Molecular Genetics and Microbiology. Her research in human molecular genetics started in 1989 while she was at the University of Minnesota.Dr. Ranum’s research strengths include myotonic dystrophy, ataxia and amyotrophic lateral sclerosis. Her laboratory team applies research techniques such as genetic mapping, positional cloning and transgenic mouse models. In 2015, she won the Javits Neuroscience Investigator Award from the National Institute of Neurological Disorders and Stroke. The four-year, $2.5 million grant funds her studies of an inherited central nervous system disease. Henry Baker, PhD, chair of the department of Molecular Genetics and Microbiology, said Dr. Ranum’s work is leading to new understandings of the mechanisms that create neurological diseases. This fund was established in 2007 by the estate of George H Kitzman to support a professorship in the UF College of Medicine’s genetics department. Kitzman received a bachelor’s degree form the University of Wisconsin and a master’s degree from the University of Colorado. He taught at many universities, including Eastern New Mexico University and Fort Hays State University before moving to Florida in 1990, where he owned a hearing aid center. He passed away in 2001.